A Daily Dose of Antioxidants? 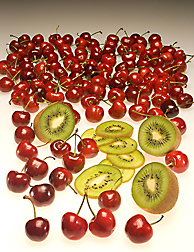 Kiwifruit, Bing cherries, and many other fruits are packed with healthful antioxidants. But how much of the antioxidants are absorbed once you’ve eaten the fruit? We’ve all read about the antioxidant superstars—the blueberries, blackberries, and cherries, for instance—that are so effective at squelching the audacious free radicals that bombard our bodies’ delicate cells every day. But few studies have been aimed at investigating how well our bodies use these antioxidant-rich foods—and whether or not their soaring ORAC (oxygen radical absorbance capacity) scores really translate into practical, disease-fighting capabilities in humans. The ORAC method, which was developed and refined by ARS scientists, measures the capacity of a food to mop up the destructive free radicals that are generated when we engage in such everyday activities as eating, breathing, and exercising. Our bodies also stir up these unstable molecules when we’re battling a cold or a disease—or are exposed to pollution, cigarette smoke, or the sun’s ultraviolet rays. So, to combat such oxidative assaults, is it enough to just feast on foods that researchers tell us are high in antioxidants? Not necessarily. According to Ronald Prior, a chemist at USDA’s Arkansas Children’s Nutrition Center in Little Rock, to be clear about which foods offer the best antioxidant delivery system, we need a better understanding of how our bodies absorb and metabolize the many phytochemicals found in richly colored fruits and veggies. “These plant compounds really vary in their bioavailability and may influence our bodies’ biological processes in many different ways,” he says. And while several studies have linked the increased consumption of fruits and vegetables to a lower incidence of cancer and other diseases, Prior says that scientists haven’t really been able to pinpoint which components in foods are responsible for the beneficial effects. 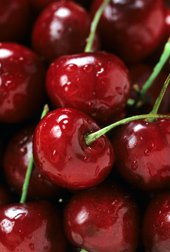 Bing cherries—rich in antioxidants and one of the fruits studied for antioxidant bioavailability. To learn more, Prior and colleagues recently investigated how various fruits—all known for their impressive antioxidant content—affected the blood antioxidant levels of volunteers. Collaborators included researchers at the USDA Human Nutrition Research Center on Aging at Tufts University in Boston, Massachusetts; the USDA Western Human Nutrition Research Center in Davis, California; and the University of Maine in Orono. Volunteers were asked to eat varying amounts of the fruits, which included Bing cherries, dried plums, kiwifruit, red grapes, strawberries, and wild blueberries. Most of the servings were relatively large. 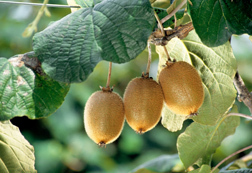 For instance, volunteers in the cherry study popped down 45 of the small fruits; those enlisted in the kiwi study ate 4 entire fruits. Then, using the ORAC method, Prior and colleagues analyzed each volunteer’s blood levels for the fruit’s antioxidant capacity. The grapes, kiwifruit, and wild blueberries were the best performers, according to Prior, whose findings were reported in the April 2007 issue of the Journal of the American College of Nutrition. Wild blueberries are certainly one of the most-heralded antioxidant-rich fruits. But the study revealed that a larger serving of the berries—at least a half-cup to more than one cup—was needed to register a real spike in volunteers’ blood antioxidant levels. A so-called high dose, equaling one and one-third cups of the berries, triggered the most significant leap. “The predominant phytochemicals in blueberries are anthocyanins, which aren’t readily absorbed or perhaps are unstable in the body and are degraded in the gastrointestinal tract before they are absorbed,” says Prior. But there’s still more to learn about the digestibility of this important class of compounds, he notes, since at least 27 different anthocyanins are found in wild blueberries. Plums, on the other hand, were a bit of a disappointment. Despite their inherently high levels of an antioxidant called “chlorogenic acid,” they didn’t induce an uptick in volunteers’ antioxidant levels. That’s because the pure form of chlorogenic acid isn’t readily absorbed by the human body. Making wise food choices is hard enough work. But who knew that the mere act of eating can leave our bodies’ cells battered and beleaguered? In the process of breaking down and metabolizing food, our bodies generate a lot of free radicals. “And without any antioxidants present, like those from colorful fruits and vegetables, for instance, there’s nothing to counteract this detrimental effect,” says Prior. Antioxidants can almost be viewed as an antidote to the body’s problematic, not-100-percent-effective, energy-processing system. This cause-and-effect relationship between consumption of foods lacking in antioxidants and decrease in antioxidant blood levels was backed up by the study ARS conducted. In it, volunteers who drank a shake containing carbohydrates, protein, and fat—but no antioxidants—produced blood samples with a reduced ability to counter noxious free radicals. Eventually, Prior would like to make preliminary projections of antioxidant needs based on a person’s energy intake or calorie consumption. Of course, other factors—such as age, health, and environmental exposures to damaging oxidants—all influence an individual’s bodily antioxidant status. In the meantime, most Americans can do their bodies good by eating the recommended amount of fruits and veggies every day.—By Erin K. Peabody, formerly with ARS. Ronald L. Prior is with the USDA-ARS Arkansas Children’s Nutrition Center, 1120 Marshall St., Little Rock, AR 72202; phone (501) 364-2747, fax (501) 364-2818. "A Daily Dose of Antioxidants?" was published in the March 2008 issue of Agricultural Research magazine.